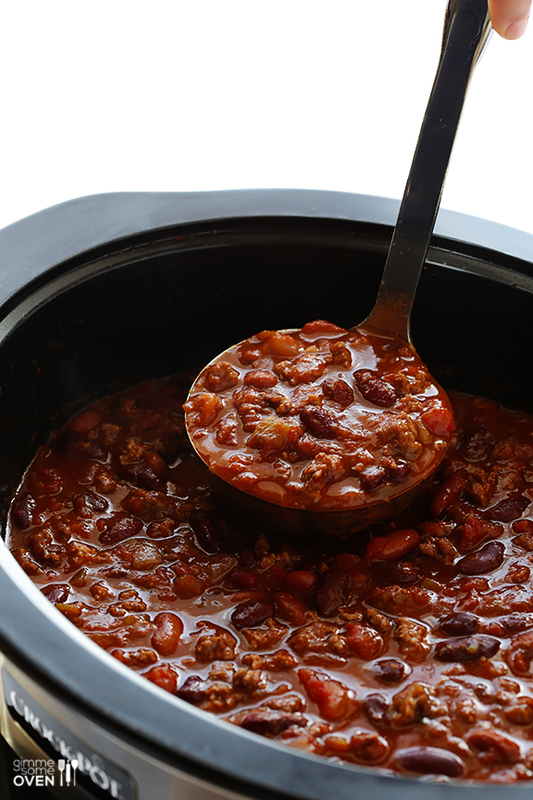 There are few things that smell better than a yummy meal cooking in a Crock-Pot. 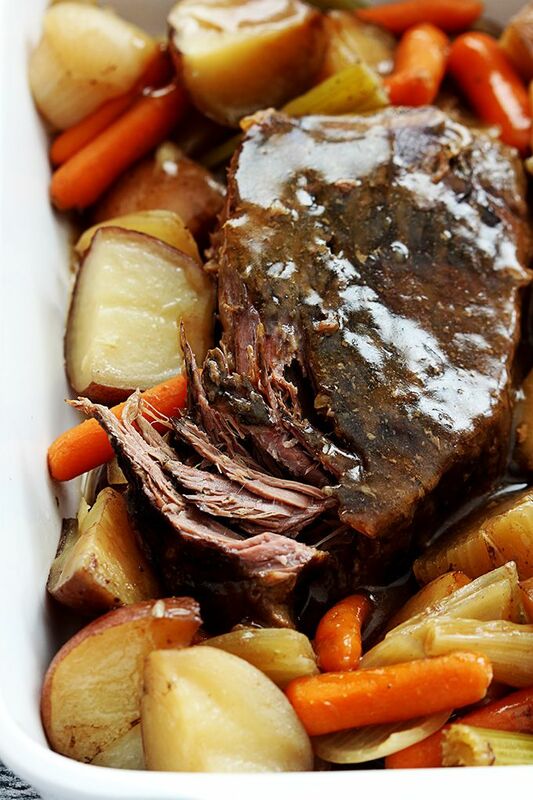 For the uninitiated, Crock-Pots (or slow cookers) simmer food, which allows unattended cooking for hours at a time— perfect for folks who want a home-cooked meal, but don’t want to slave over a hot stove. Plus, you can use a slow cooker for any meal. The proof is in these Crock-Pot recipes for breakfast, lunch, and dinner. 2. Add in the chopped mushrooms and onion and saute until tender. Add in the garlic powder. Briskly whisk in the flour until a thick dough forms. Cook for about 1 minute. 3. Very slowly add in the milk whisking constantly until thickened. 4. Reduce the heat to low and allow to simmer and thicken. Remove from heat and stir in the sour cream. 5. Spray a large slow cooker with nonstick spray. 6. Pour in the creamy base. 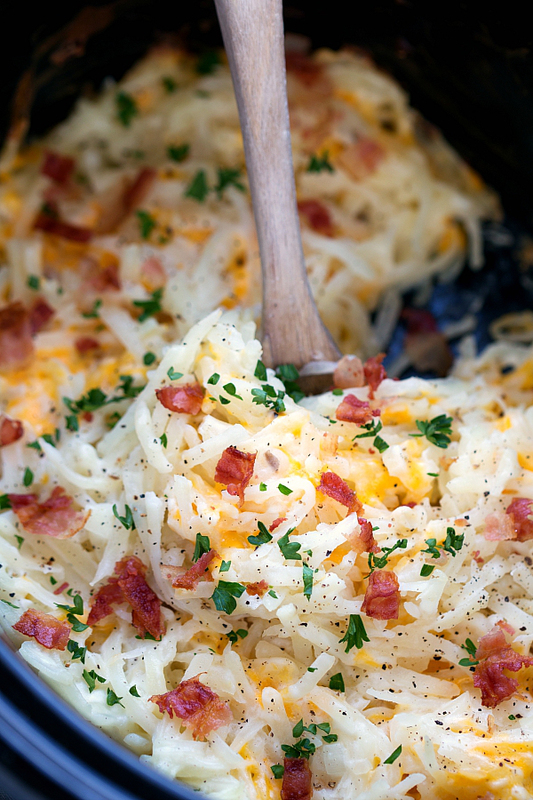 Top with the whole package of hashbrowns and the shredded cheddar cheese. If you like an extra cheesy casserole use a full cup, otherwise use just 3/4 a cup. 7. Add salt and pepper and stir everything together. 8. Cover and cook on high for 2-3 hours. Remove the lid and allow to cook another 30 minutes to an hour to get crispier on top. Just watch these times carefully depending your slow cooker— if you have a really hot one it may be done sooner and a cooler one will take longer. Each crockpot is so different! 9. Top with toppings of your choice such as cooked and chopped bacon, chopped parsley, additional seasonings, etc. 2. Add the remaining ingredients, and stir to combine. Cover and cook on low for 6-8 hours, or on high for 3-4 hours. Taste and season with additional salt and pepper or seasonings if need be. 3. Serve warm, with desired toppings. 1. Whisk together steak seasoning and Italian seasoning. Rub seasoning mix all over the roast. Grease a slow cooker. Add roast, beef broth, potatoes, carrots, onions, and celery. Cover and cook on low for 9 hours or on high for 6 hours. 2. Minutes before serving, prepare the gravy. Drain liquid from sow cooker into a medium sauce pan. Add salt, pepper, garlic powder, and onion powder. Bring to a boil. 3. Whisk together corn starch and cold water. Add to sauce pan and reduce heat to medium-low. Allow to thicken for 3-5 minutes. 4. Place roast on a large plate or serving platter. Use a fork to gently pull apart the roast. Pour gravy over roast (and veggies if desired) and serve. Enjoy! Note: This method also works well with larger roasts up to 8 pounds. Simply adjust the amount of carrots and potatoes to feed however many are in your group. Follow instructions as written. For roasts over 8 pounds, double the entire recipe. Crock-Pot cooking is also fairly simple. If you’ve got a fully equipped kitchen (like the residents at The Commons on Kinnear in Columbus, OH), that’s great. But since there isn’t a lot of prep involved, it’s not necessary. We’re always on the lookout for a good Crock-Pot recipe. Got a fave? Share it in the comments!